The LUCID 10 inch memory foam is a new innovation in the mattress industry. It cradles the body and provides good pressure point relief, ensuring that you wake up feeling more relaxed without pain. This mattress, being Memory foam, is quite comfortable and is softer than you could ever imagine. Despite this softness, the mattress is hard enough to last for a very long time. When you lay on this memory foam, it automatically conforms to your body?s weight, giving you the ultimate comfort you need. When you get up, the mattress comes back to its original fullness and size. Below are the features of the LUCID memory foam mattress. It is designed with open cell technology that improves airflow and keeps your mattress cooler. This technology removes the normal problem with traditional memory foam mattresses that retain a lot of heat. It provides long lasting and more durable foam, helping you stay comfortable throughout the night for a long period. This mattress has a plush feel because of the thick comfort layer used in its design. Those who have lower back pain can alleviate this pain when sleeping on a proper mattress. Thankfully, LUCID memory foam has all the features to give you a comfortable sleep throughout the night. 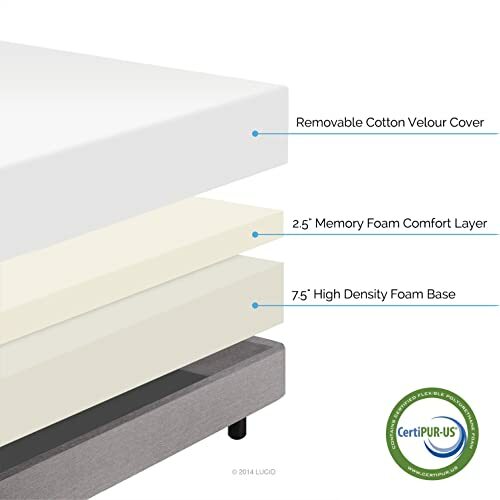 Your back pain will definitely be alleviated when you sleep on this memory foam. While other foam mattresses have 2 to 3 years warranty, the LUCID memory foam offers an amazing 25 years warranty. The company trusts their product, and they know that the mattress is sturdily designed to last for many years. Certainly, there is no other mattress in the market that provides such warranty. This is the reason LUCID memory foam mattress is highly regarded with hundreds of customer reviews and 4.5-point ratings. Some customers have complained that the mattress softens too much. If you have this issue, the warranty surely covers you, and you can seek for a replacement mattress with no additional cost. The faint smell of the mattress when it is bought new may not be ideal for those who have allergic issues. But the smell does not stay long (usually it goes away after 3 to 4 days). When it comes to memory foams that effective contours to the body and provides great comfort, they don?t come better than the LUCID memory foam. It is designed to almost perfection and has all you need to have a good night?s sleep. It has so many positive reviews on Amazon, and you will wonder why it?s sold cheaper than most other types of memory foam mattresses. In essence, its overall value definitely outweighs its price. If you are looking for an ideal memory foam mattress for your overall comfort throughout the night, the LUCID memory foam is a great option.